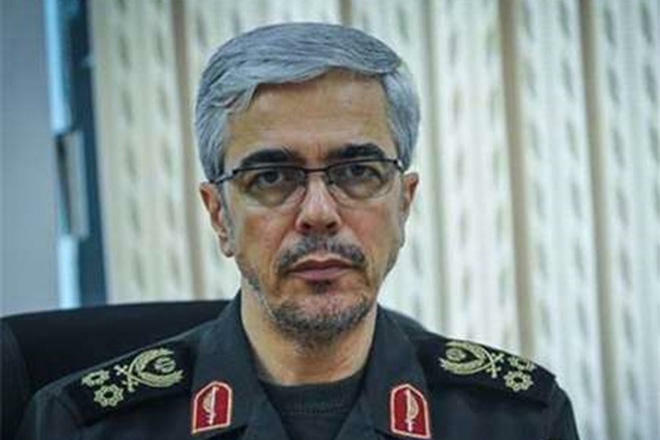 Iran is not seeking permission from anyone to enhance its defensive capabilities and defend the interests of the country and the nation, said the Chief of Staff of Armed Forces Major-General Mohammad-Hossein Baqeri on Sunday, Trend reported citing IRNA. General Baqeri made the remarks speaking to reporters on the sidelines of a visit to an exhibition in Tehran where the 40-year achievements of the Islamic Revolution were put on display. “The Europeans owe a big debt to the Iranian nation,” the general said, adding that Iran has honored all its commitments under the 2015 nuclear deal while the other parties to the deal that were expected to lift all the banking and economic restrictions on Tehran, failed to remain committed to their pledges. The United States withdrew from the accord and the other parties are hesitating to implement their commitments, Baqeri said. Noting that Iran’s defensive capability, including missile power, is not negotiable, he said that now the Europeans have to implement part of their commitments with resolving the issue of banking and economic exchanges with Iran.